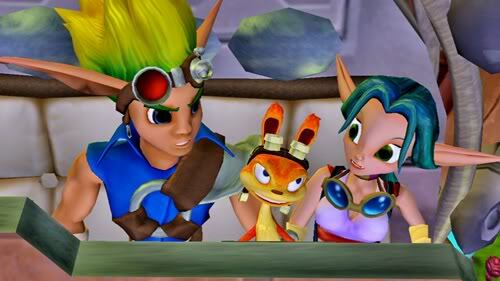 Been playing Jak and Daxter Trilogy for Playstation 3. Been playing the first game in the series and I liked it very much, never got/took a chance to play it when it was out for the Playstation2. So I had been looking forward to a HD collection with these games for some time, so I’m glad they where made. When all three games are finished, when that will be… I’ll probably do a proper review for them. This post also marks my 500th entry on my page! Goddamn, a big number! I’ll be going for another 500 of course! I’m not stopping, I’ll keep on writing as long as I need to. And if people want to read that, then that’s even better. So thanks to all who’s stuck with me. I really, really hope my copy of Tales of Graces f will arrive by Friday next week… I really want to play that game, right now! Hope I have time to play it too, much to do at work so I’ve been tired as hell when I get home. And I’m preparing for my move to the new apartment too. 5 responses on 500 posts!! I’ll keep going! Of course I will continue to stick by you for 50000 more posts if needed. I really hope my copy arrives by friday aswell but its not looking very well is it..
No, it really isn’t looking good. Never again PlanetAxel for preorders. Never! VideoGamesPlus forever! Har jag extrem tur så far jag det idag.